The Isle of Wight Council has today (Tuesday 19 May) confirmed details of work to create vehicular access to properties affected by last year’s landslip along Undercliff Drive, near St Lawrence. The council has been working with Island Roads to develop a scheme since Executive members agreed in November 2014 to create a low cost, limited access road from the west and pedestrian access from the east. The plans have been developed as quickly as possible, however due to the complex geological nature of the site, the environmental designation of adjoining woodlands and negotiations involving third party land, the scheme has not been straightforward to develop. 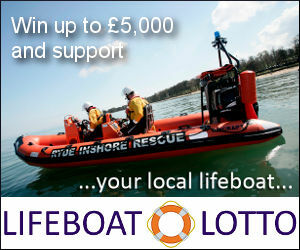 Survey work is due to commence in the coming weeks, with construction work carried out during the summer months. Vehicular access for affected properties will be via the existing carriageway with some limited widening of the road from the west, with a turning head constructed close to the current position of the road closure hoarding to enable larger vehicles to turn safely. The proposed route to the properties will be single width, built close to the existing route. It is likely that some land will be required from a third party in order to construct the road which will connect to the undamaged section of road on which four dedicated residents parking spaces will be provided. 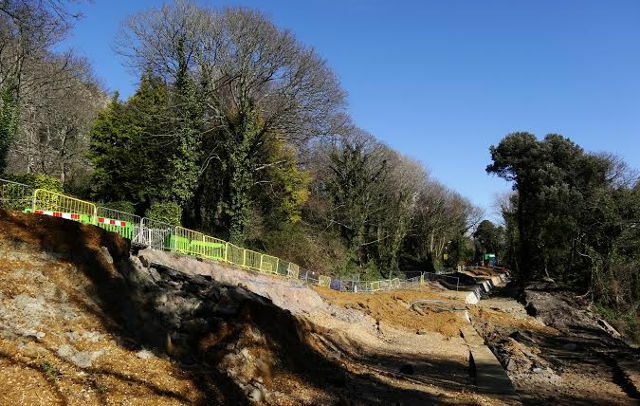 Due to the eastern landslip, it will not be possible for vehicles to drive beyond the property ‘Cheviot House’, though pedestrians, cyclists and horses will be able to continue through to Undercliff Drive and on towards Ventnor on a newly created path. At the eastern end of the access road, another turning head will be constructed, again to allow vehicles to turn safely, and a further four dedicated residents parking spaces will be provided. “This solution and the impending works are very long awaited but I am delighted we are finally in a position to start the process of allowing at least some permanent access to the properties situated there. “The commitment of this council has always been to find a solution to a very difficult situation and I think today is testament to a lot of hard work by a lot of people. I really do look forward to this scheme being finally completed and access being re-established. Letters have been sent to affected residents, local town and parish councils and local Isle of Wight councillors to make them aware of the latest plans. If you can’t see it (understandable, as it’s a pretty large file crammed into that A4 doc, here’s the download of the PDF (right click to Save). 15 Comments on "Council release plans for Undercliff Drive"
I’ve just had a quick look at this. There’s so many problems with this I don’t know where to start! Haven’t these poor people suffered enough? At least give them the respect of thinking through what you’re proposing IWC. You’ve had enough bleeding time! This work is outside the PFI, right? Why would the council be giving this work to Island Roads? This whole (in my mind, avoidable) collapse happened under Island Roads before. Why trust them again? As a an ex resident of the Undercliff and one who still owns one of the houses, the plans leave a lot to be desired. If the council are going out to tender this, what happened to the PFI contract, are not they responsible for correcting their mistakes? If they are, and you’ve got to get them to admit it, then they should be paying for it. If they are not, then they should be kept well away from the whole sorry fiasco. how much money do these very very few people want spending on them….this a solution. There are many many more worthwhile projects elsewhere on the island that won’t inevitably end up in the sea whatever money is spent. But what you say applies to most of the properties in Ventnor. What you are warned when you move here is “don’t muck it about – don’t start digging away at slopes”. Without such “mucking about” these families would still be in their houses, and the road would still be open. I don’t live too near the slip, but have been following the story and sympathise utterly with you. I hope that the situation can be resolved this year and allow you peace of mind at last. I was brought up there and its my retired parent who live there and we are just ordinary folk. They are devastated and I am worried….